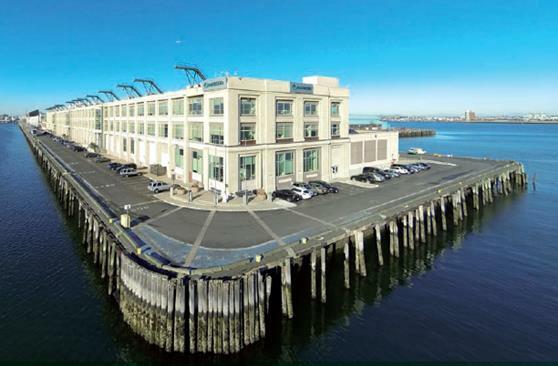 BOSTON – March 31, 2017 – The Davis Companies (TDC) has acquired 88 Black Falcon Avenue in Boston’s flourishing Seaport District, with significant plans to bring the two, three-story interconnected buildings, totaling 376,000-square-feet, to 21st century standards. With impressive ceiling heights ranging from 14 to 20 feet, efficient office and industrial/R&D infrastructure, and new amenities ideal for attracting and retaining top talent, the property is perfect for marine, industrial, research and development, and traditional office companies looking to grow in a flexible environment. Tenants will join new, pioneering businesses like Optimus Ride Inc., an MIT spinoff company that develops autonomous vehicle technologies to enable safe, sustainable, and equitable mobility solutions and which occupies 19,000-square-feet on the building’s first floor. Within the Raymond L. Flynn Marine Park, which is also home to Cruiseport Boston and The 1.4 million square foot Innovation and Design Building, 88 Black Falcon’s tenants will enjoy and contribute to the area’s dynamically increasing vitality. 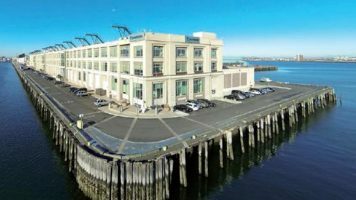 Surrounded by water on three sides, the property’s location offers unobstructed views of the Boston Harbor as well as, direct access to Route 93, the Massachusetts Turnpike, 550 onsite parking spaces, and its own MBTA Silver Line Stop. As part of the property’s redevelopment, TDC will improve a portion of the Boston Harborwalk — a public promenade that follows the edge of piers, wharves, beaches, and the shoreline around the Harbor. Completion is scheduled for Q2 2018. “We look forward to working closely with all the great companies located at 88 Black Falcon, from innovative industrial / warehouse tenants like CEVA Logistics, BBX Transportation, Lee Kennedy Co, and JCDecaux, to advanced office tenants, including Optimus Ride Inc., Cesari & McKenna, Citizens Energy, Steffian Bradley Architects, and WSP Flack + Kurtz,” said Duncan Gilkey, The Davis Companies Senior Vice President of Leasing and Asset Management and former President of the Boston Design Center (1999-2006). Working with Dyer Brown Architects, TDC is re-envisioning the building’s common areas, bathrooms, elevator lobbies, entrances, and existing restaurant / café, as well as creating a brand-new fitness center complete with showers and lockers, and bike rooms for storing and repairing cycling equipment. Dyer Brown’s design incorporates warm and worn metals and wood textures reminiscent of marine architecture, and establishing a crisp, clean exterior palette that welcomes substantial natural light and views of the Harbor, cargo cranes, and cruise ships. “We are delighted to be collaborating with The Davis Companies on such a great asset in an exciting neighborhood. Our approach to the design will celebrate the building’s rich maritime history, while upgrading the amenities and infrastructure to support the needs and desires of a broad range of tenant types,” said Dyer Brown Architects Director of Building Services Deniz Ferendeci. The Seaport’s Raymond L. Flynn Marine Park area is booming with activity and is nestled among hotels, renowned restaurants, public amenities, fitness centers, and residences. 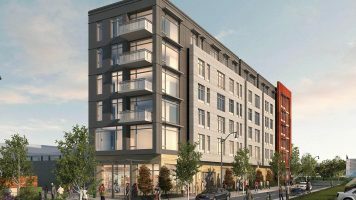 Located as it is next door to Reebok’s future headquarters at The Innovation and Design Building, 88 Black Falcon’s neighborhood will soon be home to a public, mile-long running track and expanding array of retail and dining options. Massport’s Seaport Transportation Center will bring additional visitor parking to the area by Spring 2018. TDC is known for its repositioning work across the Eastern United States. The firm’s strategy, which is focused on community, collaboration, and conservation, revamps properties into vibrant, amenity-rich business destinations. In addition to the Boston Design Center, TDC has recently reimagined two other Seaport properties – 24 Farnsworth Street and Tower Point on Wormwood Street, near Channel Center, as well as The Center at Corporate Drive and 67 South Bedford Street, both in Burlington, MA; The Xchange in Bedford, MA; One Cabot Road in Medford, MA; and the landmark Union Trust Building in Pittsburgh, PA, to name just a few of the close to 100 repositioning projects that it’s completed in its 41 year history.